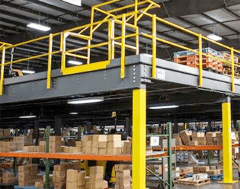 Previously, we discussed the benefits of mezzanines, and how they can easily maximize available warehouse storage space. An added benefit of mezzanines is the many accessories available for them, making them an extremely versatile piece of warehouse equipment. The various accessories allow for customization and added value of your mezzanines, and work very well for multiple functions. Keep reading for more information on what mezzanine accessories are available, and how they can add additional features to your equipment. Staircases: Mezzanines with multiple levels benefit from the use of staircases, as well as single-level mezzanines. Staircases can be strategically placed for easy access from certain areas, increasing productivity. Handrails: An important safety feature, handrails can be custom installed for particular requirements or specifications. Gates: For controlled access, gates can be installed along handrails and in areas on mezzanines as needed. Ladders: There are many types of ladders for mezzanines, each having beneficial functions. Crossover ladders help move product from one mezzanine to another, or otherwise product quick and easy access between areas. Vertical and safety ladders are useful for maintenance or emergencies, as an alternative to stairs. Bracing: Bracing enhances the structural integrity of mezzanines, and can provide added support in needed areas. Flooring: There are various options for flooring (also known as decking), depending on the mezzanine. It can include grating, tread plates, composite, and more. Mezzanines are unique to their function. The accessories that may be beneficial for one warehouse layout system may be different from another warehouse’s mezzanines. For advice on which accessories are right for your system, or other warehouse equipment that may be beneficial for you, contact S.W. Betz. The S.W. Betz Company, Inc. has been providing businesses in Maryland and beyond with all of their essential Weighing, Material Handling, Dock, and Warehouse equipment since 1933. We also assist customers with the installation and repair of mezzanines and other warehouse equipment. If you would like to learn more about mezzanines, please contact S.W. Betz by calling 410-574-1414 or 800-332-0322 today! You can count on the S.W. Betz Company to work with you and provide you with our extensive knowledge of the industry. This entry was posted on Thursday, December 24th, 2015 at 1:54 am. Both comments and pings are currently closed.